I often face this workflow problem when I'm working on my open source project React Stepzilla for example. I then discover that I'm not going to be able to complete the fix easily and regret not creating a new issue branch "issue-27"
I then run "git checkout -b issue-27". This will create a new branch called issue-27 with all your local changes. 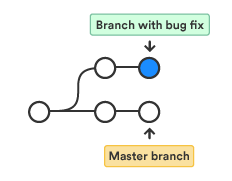 I'm now in a new local branch called "issue-27"
I then push the new branch to origin and track it "git push -u origin issue-27"
If you checkout master now and run "git status" you will notice that the changes are not longer "pending" here and your master is clean. Once you are done with your work on the "issue-27" branch, then your can merge the changes into "master" via a github "pull request" or locally and then delete the "issue-27" branch. Hope this helps you guys, also here is a good stackoverflow that tell your more.